This is a collection of the over 100 best wedding photography tips for photographers. Beginners will find a lot of useful tips here while seasoned photographers will discover gems as well. 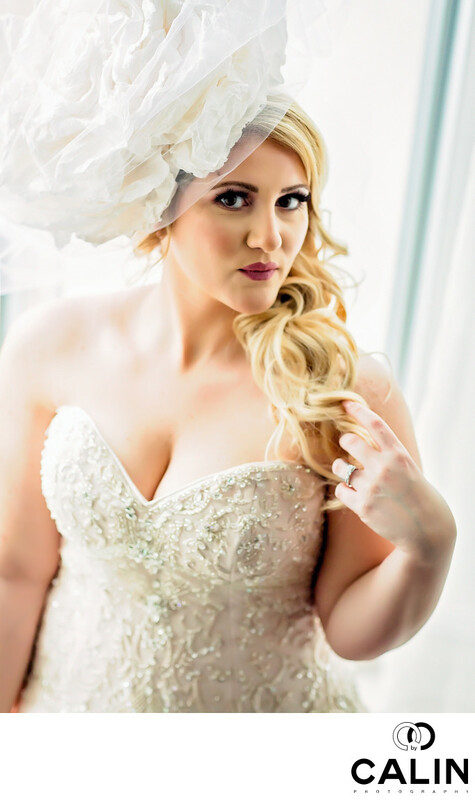 If you are a bride looking for tips on how to have the best possible wedding photographs, please visit my page on wedding photography tips for brides. This page is the result of thousands of hours of study, workshops, practice, discussions with world class wedding photographers and conclusions drawn from the many weddings photographed. Enjoy it!!! Get low, get high, get close, get far, get dirty. In other words, change you vantage point so your images look different from Uncle Bob's. I doubt uncle Bob would shoot on his belly a photo like the one above. Have a list of shots and learn it by heart. That is your back up plan. It is hard to be creative under severe time constraints and pressure. When that happens and you have only 5 minutes for the photo shoot, it is good to get back to the basics and do the pictures on your shot list. For this I use an app named Quip where myself and my second photographer can look at the shots we need to do. Ask the bride to create her shots list, especially for the family photos. To eliminate any misunderstandings, talk with the bride in advance and ask her to prepare a list of shots she loves. While I can not guarantee any shot and I tell her that, I will do my absolute best to honour the bride's wishes. When it comes to formal or group photos a shot list will save you a lot of time you can use for creative shots. Post every single wedding or engagement you photograph on your blog. It will make you grow as a photographer. This is a piece of advice I learned from Emil Kuliev. Doing this will make you achieve a few things. First, you will need to raise your standard and be more consistent as you will need to post photos from every wedding you shoot, not only from the ones you did an amazing job. Second, from an SEO perspective you are better off posting more events as Google will see that as a positive sign your business is active and growing. If you don't post regularly, to Google it looks you are not busy and so you will not show in search results. Ask about any family "situations" before the wedding (father and mother divorced) so you can handle the issue delicately on the wedding day. 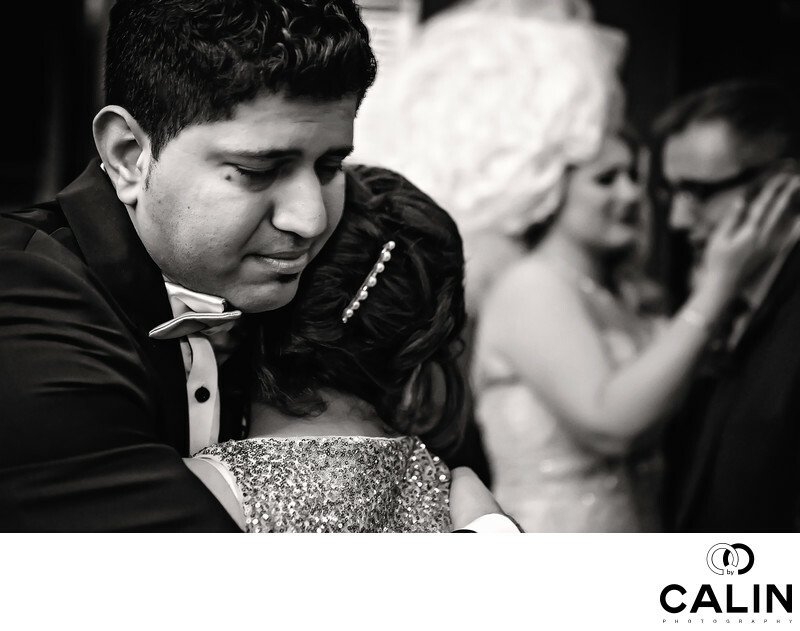 Can you imagine if you ask the bride's father to hug her mother when they have been divorced for a long time? Have a member of each family coordinate the family photos. You will save a lot of time and effort if you have a person who knows the family members organize the family photos and call the relatives for the group shots. In Toronto, there are so many ethnic weddings that it is almost impossible to get the names pronunciation right, so having a relative of the bride and one of the groom direct the family photos. You will thank me for this later, especially when the guests had a few extra drinks before the formal photos. Have backup clothing. I ripped pants during weddings, got soaked in severe rain, got dirty shooting on the ground and I always thanked my set of spare clothes I keep in the trunk of my car. Have a backup camera. In case your main body breaks down, have a second camera you can use. I always shoot with two 5D Mark III bodies. At my last wedding one of my cameras refused to focus and I continued shooting with my second camera. The bride and groom did not even notice. Have at least one weatherproof lens. If it starts raining, you don't want to run for cover if the bride wants to continue the photo shoot. As such, a weather proof lens will prove handy. My backup lens for such situations is the Canon 24-70mm f 2.8L II USM which is very versatile and has a rubber ring that makes it weather proof. Owning such a lens is also a selling point as while other wedding photographers will stop covering the wedding on a rainy day, I will keep going! Turn off your camera sound. In the church or during the ceremony, use the silent shutter more and disable the sound on your cameras.The click your shutter makes and the auto focus beep are extremely annoying in a quiet church. Please be considerate. Master lighting. Lighting is the main ingredient in wedding photography. In fact photography literally means writing with light. If you are an available light wedding photographer (we have all been there) learn how to use flash and strobes so you can achieve good images under any weather conditions. Hire a lighting assistant. Once you mastered lighting, you will need someone who helps you with the light stands, flashes, reflectors, tonnes of equipment etc. Know your equipment! For a long time I kept buying more and more equipment and my photography did not improve, quite the opposite, I hit a plateau and I kept fumbling as I did not know how to use my latest and greatest piece of gear. Many great photographers confessed to have experienced the same issues described while they added new items to their gear. On the other hand, once I was shooting a wedding and my flash batteries died during the first dance. It took me about 10 seconds to swap the flash batteries in complete darkness as I knew my flash inside out. Top Five ingredients of a Great Wedding Photo: Light, Location, Posing, Technique, Emotion. When you can control the flow of events, look for light first, pick the time of day with beautiful light (golden hour) or create the light if possible. That will be key for a good wedding photo. Next, look for a beautiful location. Think about the pose you want the couple to achieve, then set the ISO, shutter speed and f stop to obtain the desired exposure. Last and very important, inject emotions by cracking a joke or doing something funny. If there is no emotion, you will be photographing a pose and that shows. Master posing. 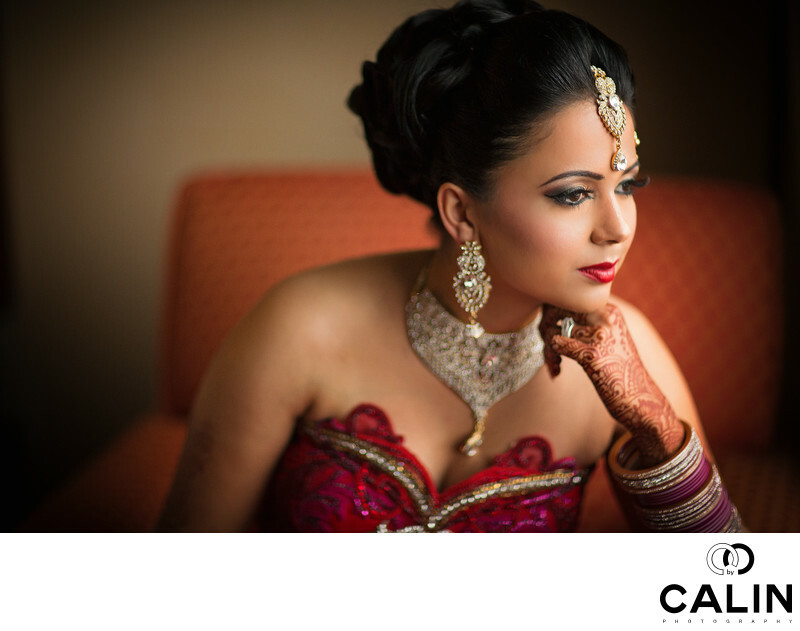 Posing and lighting are the main things that differentiate professional wedding photographers from amateurs. Posing is especially difficult as it takes years to learn and refine it so that your images look natural. Posing can make a bride look gorgeous...many top wedding photographers are also good posers. Visit the location prior to the photo shoot, ideally at the same time when you will photograph so the light is the same. That will save you a lot of time on the wedding day. If you can not scout the location, consider using an app such as sunseeker or check out scoutt.com. Have plenty of memory cards and batteries at your fingertips. If you run our of space on your card, just swap the card and keep shooting. When your battery is about to die, change it when you have a second. Shoot on two cards at once or back up as soon as possible. I shoot on my 5D Mark III using two cards and recording the photos on both of them at the same time. Use different brands of memory cards. One of the reasons why I love the 5D III is because I can shoot on a CF and another SD card at the same time. To reduce the chance of card failure even more, I also use different brands, a Sandisk SD card and a Lexar CF card or the other way around. Write on your memory cards your phone number and the following: I will pay $$$ for the photos on this card. If you lose the card, God Forbid and someone finds it, the Good Samaritan can call you and return the card to you if you have your phone number on the card. Hire a second photographer. Even after years of shooting I still use second photographers. The list of reasons is so long we can not cover it here but here are the main ones. You can not be in two places at the same time. For example your second shooter can do the groom preparation and you do the bride preparation. The second shooter can get different angles and shots during various parts of the day. The second shooter can become a lighting assistant when you need someone to hold the light stand or reflector. The second shooter can watch your equipment when you need to run around. Hiring a solid second shooter is a big expense but it is good insurance. If you are not busy, contact photographers in your area and offer to second shoot for them if they second shoot for you. Bingo! Ideally, your second photographer should shoot the same camera brand or even better, the same camera. In case one of your main lenses/cameras breaks down, you can borrow one form the second shooter. Even more, if both of you shoot the same camera and have the same camera settings, you can just pick up the new camera and keep shooting. Clients will mirror you. Be fun and they will be fun. Stay calm and carry on! If things can go wrong on the wedding day, they will. Murphy's Law. I have seen a horse go wild during an Indian wedding, a cake arriving damaged, the wedding dress being ripped and so many more. Lots of things will go wrong on the wedding day and expect that to happen so you are not surprised. Stay cool. If you panic, the bride and groom will panic as well. Know your clients and decline photographing a wedding if your style does not match that of your client. Every couple getting married is unique. Some brides want a photojournalistic coverage while others need directions and are happy to work under your directions. Most couples fall somewhere in between. I personally like control and give directions when moments don't occur naturally. As such, I will tell couples that want a pure photojournalistic coverage I am not their photographer. The couple will find a photographer who fits their style and who can create the imagery the bride and groom want. Photograph the wedding as your life depended on it. I learned this tip from Jerry Ghionis. Always shoot the wedding like it is your daughter's wedding. I put so much effort when I shoot a wedding that my body is sore for 2 or 3 days after the wedding. Most of my clients congratulate me on the images taken before they even saw 1 photo!!! I climb trees, shoot on my back, on my belly or in any imaginable position. When I arrive home, I know I did my absolute best for the couple on their Big Day. Photograph for the next generations ...be unobtrusive, but not shy. If you have to get the shot, go for it...but don't knock down bride's grandma. I always think how their children would like to see their parents weddings. They would want a closeup of their parents not one with 100 iPhones and as many heads of guests taking photos with their phones. As such, I get in front of everybody and shoot from the best spot available, get my shot and then move immediately so I don't bother the guests. Wedding Photography Tip #30: Shoot in manual mode. Cameras can be fooled in automatic or semi automatic modes. It happened so many times when I was shooting in aperture priority for my camera to be tricked by a particular scene. The bride in front of a white wall would be underexposed by 1-2 stops for example. Shoot in manual mode, that will help you become a better photographer and reduce time you spend in post production adjusting the exposure. Shoot receptions in manual mode and use flash to freeze action. I remember second shooting my first wedding many years ago. The day went well and I was confident, but then I went to the reception in a dark hall. I was shooting aperture priority and all my images were blurry as my shutter speed dropped under 30th of a second. Learning how to use flash is important. That was a great lesson for me. Learn something new and strive every day to become a better photographer. The competition in this industry is so fierce that one can not afford not to learn something new every day. That is why a professional photographer over time will be better than a part time one. The professional photographer will work 12 hours on improving the craft whereas a part time photographer will be lucky to get 2 hours after work every day. Shoot raw. In case there is anyone shooting jpegs, stop it please. Shoot raw. You have so much more information and latitude when shooting raw there is no debate on this one. If you shoot raw, photograph in black and white mode to see the scene illumination and composition properly. Colours can be distracting sometimes and shooting in black and white will allow you to focus better on the light and on composition. If you shoot in raw, you will be able to process your image in colour in post production. Your subject should be the brightest part of the image. The viewer's eyes travel to the brightest part of the scene first so make your subject the brightest. You can achieve this by positioning the subject against a dark background or by adding light on your subject. Exception: you want the subject to be a silhouette and you place the subject against the brightest part of the scene. Before committing to a location or scene, analyse the background. Your background should be uniformly coloured like a seamless paper so the subject is emphasised. Have a background with a maximum of three colours in the background to eliminate distractions. Also, your background should be at least one stop darker than the bride and groom. That way, your subject will be the brightest part of the photo. It is THEIR WEDDING and NOT YOUR PHOTOSHOOT. Many times brides disregard your well intended advice and you might take it personally. You told the bride you want to shoot the creatives at golden hour and she scheduled the photo shoot at 1pm. Don't take it personally! At the end of the day, the most important for the couple is to enjoy the day as this is their wedding and not your photo shoot. If the couple is shy and don't want you around them, use a telephoto lens so you can shoot from a distance. That is a great way to start the shoot until the couple warms up. Try to determine if the couple is camera shy before the wedding. That brings me to the next tip. Shoot the couple's engagement shoot, even if you have to do it for free. En engagement photo shoot is a perfect opportunity to work with the couple, to learn about them and to make sure they are your clients (your styles match). As such, convince the couples to do an engagement session. On the wedding day things will run more smoothly and the results will be much better. Use the consultations and the engagement sessions to learn about the couples strengths and weaknesses. I am not sure about you, but none of my couples are celebrities with perfect faces and bodies. Still, for me everybody is beautiful and my job is to emphasise their beauty through lighting and posing. Most people have a preferred side and I always ask them how they take the selfies...that will tell you which side it is. Also the way the hair is parted could be an indication of how which side they prefer. Usually the least favourite side is covered. Knowing that will allow you to take better photos of the bride and groom. Find out who is paying for photography. In many cases the parents pay for photography and the bride and groom don't care too much about their wedding images. As such, they will not give you enough time or will not work with you as hard as when they pay for your services. Also, the coverage style might be different. While the parents would love a traditional style, the bride and groom might prefer a photojournalistic one. If the difference in style is drastic, that could be a recipe for disaster if you accept to photograph the wedding. Imagine that the mother of the bride asks you to shoot traditionally while the bride does not want to be posed. Everybody will be frustrated, so please find out before the wedding who your client is. Be open about how much the couple can expect to pay in total. Most couples have a wedding budget and they can not go over it. Avoid hidden charges and anticipate extra costs you might incur. One of the most common ones are the photography permits. Inform the couples that the couple is responsible for the permits. Ask the bride to give you a list of contacts for the wedding day. That way, if anything happens, you can contact the key people and let them know what intervened. Ask for the church rules with respect to wedding photography and talk with the priest before the ceremony. If you are a guest in someone's house, you will follow the rules, so know the church rules first. That way you can bring the appropriate equipment. If the priest does not allow movement, you will need long lenses. If the church is dark, you will need flashes. If they don's allow flashes, bring a camera with extraordinary ISO capabilities and prime lenses who shoot in low light. I use my Canon 35mm f1.4 L lens and the Canon 85mm 1.2 L lens. When shooting in harsh sunlight, place the subjects in the shade and if not possible, place them with the back towards the sun. Despite the fact you advised the bride to avoid 12-2pm shoots, often they still schedule the family photos or even the creative shots when the light is bad. If that happens, place the subjects with the back towards the sun or in shade. If you are shooting a different faith wedding, learn about the traditions and ask the bride about the crucial moments you should capture. Here are a few: garlands exchange in a south asian ceremony, breaking of the glasses and the hora in a jewfish wedding, the first kiss, ring exchange in a Christian wedding and many many more. First kiss should last 3 seconds. Often the bride and groom kiss super quickly and we can not catch it. Ask the couple to take their time. If you miss it, ask them to kiss again, immediately after the ceremony in the same spot. I have done it in the past and the newlyweds generally don't mind. Don't come back home without a photo of the shoes and dress. My wife drilled this into my head when many years ago I would have no images of the shoes or a full body portrait of the bride in her wedding dress. Ask the bride about any special details of the weddings you should photograph. Many times the "something old" is a family heirloom such as a piece of jewellery, a garter or even a piece of the bride's mother dress used to saw the new dress. Ask the couple if there are such elements. Give the couple some sample photos as soon as possible so they can share them on social media. That will keep the couples happy and bring you referrals. Ask your bride to walk slowly down the aisle and to look towards the groom as opposed to looking down. That way you can take a few shots of the bride and her father walking down the aisle. Also, when brides walk slowly, they have to cross their legs and form a hourglass shape naturally. Have water and energy bars in your car to recharge your batteries. Weddings are long and hard days and often there is no water around. The bridal party will hydrate in the limo, but we, as wedding photographers need to be prepared. Often the couples feed us during dinner, but I shot weddings where they just forgot that aspect. It happens, so be prepared! Do not delete images in camera. In an effort to save culling time, many photographers delete bad images in camera or they ask their assistant to do that. I have to say deleting images on the wedding day is a terrible idea as the files can get corrupted, you might delete good images or worse, your assistant might format the card or delete all images by mistake. Charge Nimh batteries two days before the wedding. I am referring specifically to Nickel Metal Hybrid (Nimh) batteries who hold the charge for a long time. Why am I suggesting that? In case of a blackout on the day prior to the wedding or if anything intervenes, you are covered. I use Envelop and Powerex (Nimh) batteries for my flashes and that works for me. That way I am not stressed out the day prior to the wedding. Gel your flashes so that the light temperature of your flash matches that of the ambient light. This one is technical, but you can not afford to have mixed lighting as the skin tones and the dress will look horrible. If you are in a mixed lighting scenario, you will have a post processing nightmare. 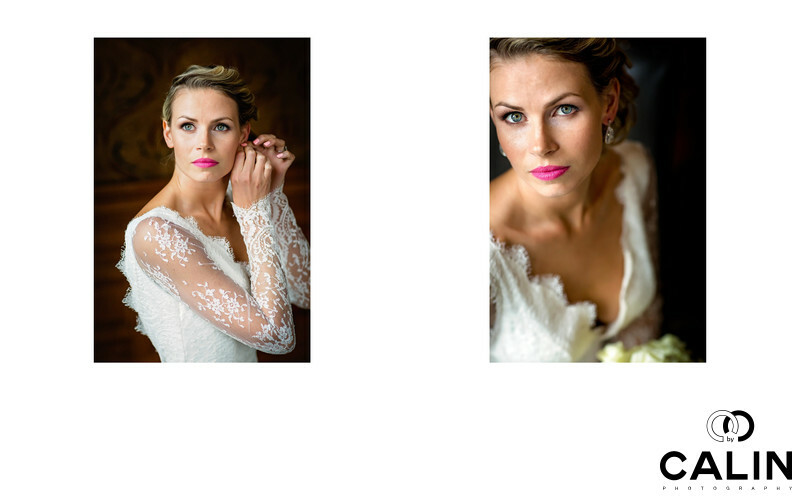 Bridal portraits. Turn the bride's body away from the light and face into the light. As you can see in the image above, turning the bride's body away from the light and the face into the light achieves a few goals. First, the body turned away from the light is slimmer as half of it is in shade. Second, the face becomes the brightest spot of the photograph and the viewer's eye will go directly to it. Place the emphasis on your subject, or make the subject pop. How? Your subject should be the biggest, brightest and the most in focus. Apertures between f1.2 and f2.8 make your subject pop when the shot is taken with a medium telephoto (85mm). Slow down the ring exchange and make sure the ring hand is not covered. Before the wedding ask the couple to exchange the rings very slowly so you can take enough shots of it. A wide shot, a narrow shot and a closeup of the hands. While the main shooter takes photos of the bride or formal shots, the second shooter captures candid images. Many times the shots between the shots are better than the formal shots. In other words, when people are not pose natural moments occur and it is the second photographer's job to capture those. If you hire a second shooter, sign a contract or make sure it is clear who owns the images created by the second photographer. If you pay the second shooter, you own the images. If you trade (I will shoot your wedding if you shoot mine), discuss with the other photographer who can use the images in the social media, advertising, etc. Children are a goldmine. Don't be shy...ask the kids to do something and they will often oblige. Also, provoke or challenge them and they will react. In the image above, the flower girl started dancing during the father daughter dance and I immediately placed myself in a good position to snap the award winning shot. Slow down. You will get there faster than if you rush. I learned this from Jerry Ghionis. Do not shoot 10 frames of the same scene unless you shoot at f1.2 and you want to be sure your images are in focus. Ask your subject to mirror you. A photo is worth a thousand words, so I ask them to mirror me while I show them how it is done. Seeing a guy pose like a woman causes a lot of laughters and they feel more comfortable. Google the wedding location to see what other photographers have done in that place. Add the shots you want to emulate to your shot list for the day. Every time the scene changes, shoot wide, medium and tight so you have a variety of shots. Contact photographers in your area whose work you love and ask if you can assist them for free. Every photographer needs an assistant and that is an extra cost. Assisting will teach you things you can not learn from books and if you are a reliable assistant, that photographer will soon invite you to second shoot. Make a list of wedding photographers whose work you love. Invite them out to a cup of coffee and build relationships. Attend meetups and build a network of photographers. You can help each other tremendously. If you are booked, help the client and a fellow photographer by directing the client to that photographer. I am assuming you and the other photographer have a similar skill set and price range. Do not forget the little wedding details. The general rule is: If the couple spent time on it, you need to photograph it. I generally ask the bride and groom if they care about the detail shots and what details I have to capture. I call them the do or die detail shots. Pre visualize the shots when you scout the location. If you have a couple of friends that are willing to help, ask them to join you and shoot them. As stupid as it sounds, I visit the location and imagine where I will take the shots. Again, try to scout the location at the same time of the day as that of the photo shoot so the lighting is the same. Nothing can be worse than visiting a location at sunset and shooting at noon the real photo shoot. Nothing looks the same from a lighting perspective. Wide angle lenses distort. Use that to your advantage and make the couple look slimmer. Rule: If you shoot a landscape image using a wide angle lens, do not place the subject towards the edges of the frame as the subject will be distorted. Still, we can use distortion to our advantage. If you shoot a portrait shot, the image will be distorted along the vertical axis, so the bride and groom will look taller and slimmer. It is not dramatic, but they will lose 10 lb just through this trick. Glass, liquids and smoke look better backlit. Bridal party toasting with champagne glasses and guys smoking cigars look better if they are backlit. For backlit shots, increase ISO so that the light wraps around. In the image above, the bride is turned with her back towards the window/light, so I had to increase ISO and overexpose by about 2 stops to get a proper exposure. If the couple is short shoot from a lower angle, slightly below their eye level. That way they will look powerful and taller. If you have issues with exposure, use live view or consider switching to a mirrorless system. Many times the cameras are fooled by challenging lighting situations. In those cases, shoot in manual mode and if you can not nail the exposure, shoot in live view mode. Also keep in mind that a bright scene needs to be over exposed and a dark scene underexposed (white dress needs to be overexposed by 1-2 stops to obtain a good white). Avoid using ETTL flash mode. If you can, use your flash in manual mode to keep a consistent exposure. ETTL is fooled by mirrors, lights in the venue, backlight, etc. and often results in underexposed images. For Canon systems, images that are more than 1 stop underexposed spells disaster as you can not recover the details in the shadows in post production. The noise in the shadows is just horrible and the images are unusable. For night shots consider using video lights or some other sources of continuous lighting. 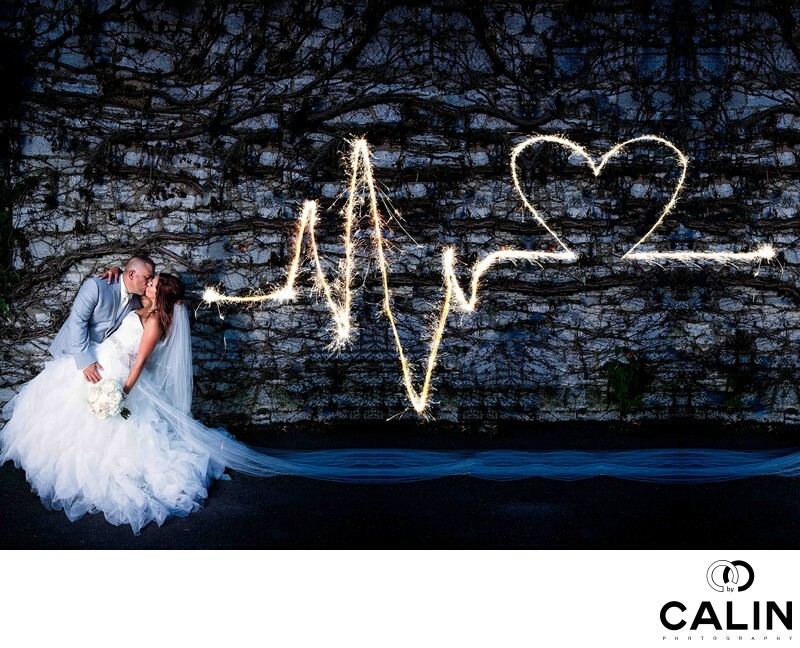 The image above was lit with a Lowel GL1 to backlight the newlywed couple. The advantages of video lights are multiple over flashes. They take you there faster as you can see what you get and time is of the essence if you ask the bride and groom to sneak out for 2-3 shots. You can also direct your assistant to place the light in the right spot and only take one shot, the keeper. With a flash you need a few test shots and it is possible that the couple will lose patience. Consider multi layering or capturing multiple stories. In the image above the groom is hugging his mother while the bride is touching her father's face. Two stories are better than one. 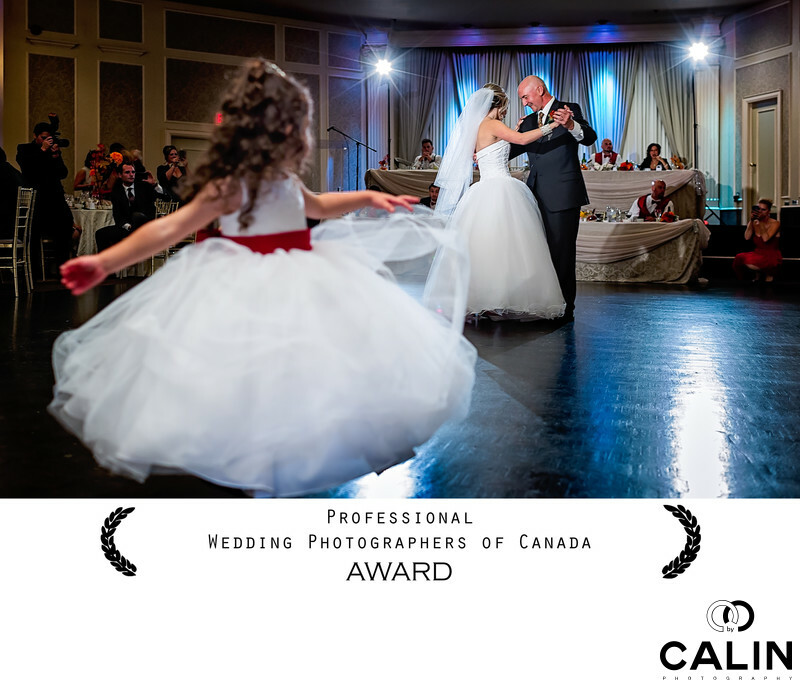 I have been invited to judge a Professional Wedding Photographers of Canada Competition and I can tell you the multi story/layer shots have a way higher chance of winning awards when executed properly. Improve your post production skills. Photoshop is a dirty word these days because of the many Photoshop failures. Also, many wedding photographers don't take the time to learn post processing or simply pride themselves by being purists so they deliver out of camera images. DON'T! When the competition is so fierce, every competitive advantage counts, so leaving such a powerful tool unused is just silly. Top wedding photographers spend hours finessing one image. If the photo looks good and the couple loves the image, who cares if it is made in the camera or in post? Was the shot above done in camera or in post? Who cares? Just other photographers. Never deliver your raw files. The raw images don't look as good as the processed photos as they are not sharpened, the white balance could be off if you shot in AWB or did not set the white balance accurately. If you deliver only raw files or SOOC, you are not offering a complete service. SOOC - Straight Out Of Camera. Format the cards the day prior to the wedding and never on the wedding day. Under severe time pressure, you might make mistakes. Never format or delete images during the wedding. Sync all the cameras before the wedding. If you can, meet the second shooter 5 minutes before you start shooting and sync the cameras. If that is not possible, use Time and Date to sync the cameras the day before the wedding. If none of the above works, photograph the same object at the same time and use that to sync the time in Lightroom. Shoot the bride from the shadow/narrow side of the face (see photo above). That is also called narrow lighting, short lighting and has a slimming effect as half of the face is in the shade. Avoid using broad lighting as that makes the face look wide and nobody likes looking wider than they are. Follow the nose! This is probably one of the best tips I ever learned from Scott Robert Lim.I always ask my assistants when they place the light to follow the nose/place the light in front of the bride's nose. In effect, that creates narrow lighting. Garter/bouquet toss. Shoot from a low angle the toss to make sure the garter/bouquet is in the shot, then run to the person who catches it or use a long lens to get the emotions. If the couple is camera shy, cheat. Excuse yourself and pretend you need to change a lens or a card. From a distance using a long lens shoot them while they act naturally. Large groups also pose themselves and with a minimal effort you can get a great posed image. Use flat lighting to photograph older subjects, (parents/grandparents of the couple). When the light comes from behind your camera, that is called flat lighting and reduces textures and dimension. As such, the light will fill the wrinkles and drastically reduce them. The best scenario is if you have a huge window behind you when you shoot older subjects. Placing the subject with the back towards the sun achieves the same effect as the whole sky behind you becomes a huge softbox. If you shoot at golden hour, you might need a fill flash or a reflector to bounce some light back into your subject or you will end up with silhouetted images. If your subjects are too stiff, ask them to lean on something and they will look more natural. Consider using prime lenses. They make you a better photographer according to top wedding photographers. In order to anticipate the moments you have to sharpen your senses and will be more proactive. Zoom lenses allow you to react quickly, but the primes punish you every time as you have to zoom with your feet. A while ago I switched from the 24-70 and 70-200 combo to a 35mm 85mm one. They provide better quality, need less light and are generally cheaper. If you want a more detailed comparison between the zoom and prime lenses please read my series on Why I Love Prime Lenses. Deliver a variety of shots to your bride. Shoot at f1.2 and f22, shoot wide, shoot tight, shoot super tight shots with a macro lens. Consider posing in motion. The best expressions are obtained when the subjects move. I learned this trick when photographing with a videographer who was directing them. Long story short, pose the bride and groom, then break them apart and ask them to go back to the pose. I they do that properly, you get a natural looking photo, if they don't, they will most probably laugh and give you real emotions. It's a winning scenario anyway. The Be Silly Tip. If people are uncomfortable posing, ask them to do something stupid silly and they will feel more comfortable. I always use my second shooter to show the romantic poses. We are both straight guys and the awkwardness is hilarious. I tell the couples: if we can do it you can do it. Already booked? Refer the wedding to another photographer. That way you will help a client and a photographer. Along the same line, if you are a wedding photographer who does not do family, newborns, children or pets photography, direct such inquiries to other photographers. They will return the favour. Have a designated wedding gown fluffer, especially for dresses with long trains. Fluffing the dress is super important as the dress have to look perfect. The bride spent so much time and money that you have to make the dress look good. Fluffing the dress takes time, so having a designated person who will fluff the dress is key if you want to save time. During receptions, you can not have both photographers leave the location. Sometimes we need to hit the washroom during a break. However, it is a good idea to have at least one photographer present in case there is an ad hoc moment that needs photographed. Watching art movies will give you fresh ideas for framing, composition, lighting, etc. If you follow famous wedding photographers you will copy or emulate shots, but if you watch art movies, you will come up with new wedding photography ideas. Practice every day to learn your gear inside out to liberate your creative demons. Once you know your gear, you will not think about the technical aspect of photography and focus on the creative side. Have a back-up photographer "on call" in case yourself or your second shooter can not make it. Place round figure people between other guests to cover them. Never place them near the edge of the frame when using a wide angle lens as they will look bigger. For group portraits, use a long lens and move back as far as possible (but make sure you are not too far so the guests can still hear you. Wide angle lenses distort and persons placed at the edge of the frame will not be happy. To eliminate or reduce distortion, where possible, use a longer lens and move back. For the formal photos, use the pyramid formula, meaning start with the bride and groom and add to the pyramid base. Make sure you add the grandparents towards the end so that they don't have to stand for a long time. Once you finish the bride's family, continue with the groom's family. If you learned something new today, feel free to share this page on social media or link to this page to help other fellow photographers.